Terraseeding is the calibrated incorporation of seed into the compost material during the EcoBerm® and EcoBlanket application process. This is an innovative process that has been developed by Rexius and now widely used for various applications in landscaping and erosion control. Simply described as Seeding with Soil, the process has several advantages over other seeding practices in the erosion control industries. Terraseeding enhances the structural integrity of the berm with root establishment.  Provides additional filtration capabilities as vegetative growth and root systems up take nutrients from the runoff.  Establishes a green berm that blends into the surrounding natural landscape.  Can be left as a permanent part of the landscape.  Terraseeding provides additional stability of the compost blanket.  Can incorporate many types of seed such as wildflower seed, native grasses and other erosion blends.  Seed is planted rather than being sprayed on top reducing exposure to the elements and wildlife.  Provides long-term vegetative erosion control in addition to the immediate control provided by the blanket.  Lowers overall project cost by combining several line-item specifications into one complete step.  Combined with Microblend in the EcoBlanket, the germination or success rate of the seed application is greatly increased. 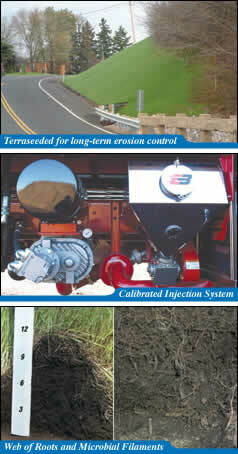 Terraseeding is a trademark of Express Blower, Inc.